Question: Is it ok to fly the American Flag upside down? Answer: The flag should never be displayed with the union down, except as a signal of dire distress in instances of extreme danger to life or property. Question: My flag was accidentally dropped and got dirty. Does it have to be destroyed? Answer: The flag should never be allowed touch the ground, the floor or water. If it does accidentally touch the ground, it does not have to be destroyed. It should merely be cleaned. Question: I’m thinking of making a quilt out of old flags. Is this ok? Answer: The flag should never be used as clothing, bedding, or curtains. Question: Is it alright to print a picture of the American Flag on my parent’s 50th Anniversary party napkins? Answer: The flag should never be embroidered on fabric or printed on paper napkins or boxes or anything that is designed to be used once and then thrown away. Question: Is it ok to fly my American Flag outside 24/7? Answer: The flag is usually flown only from sunrise to sunset. The flag may be displayed at night if it is lit during the hours of darkness. Question: Should I raise my American Flag slowly, ceremoniously? Answer: The flag should be raised quickly and lowered slowly. Question: Should I take my flag down when it’s raining, hailing or snowing outside? Answer: The flag should not be flown on days during bad weather, except when using an all-weather flag. Question: Where should I expect to see the American Flag being flown? Answer: The flag should be displayed daily at the main administration building of every public institution, including schools and polling places on election days. Question: During parades, where should the American Flag is placed? Answer: The flag should be at the centre and at the highest point of the group when flags of states, cities or other groups are displayed. Question: When a group of flags are displayed which one should be raised first? Answer: When the flags of states are flown on neighbouring staffs, the flag of the United States should be hoisted first and lowered last. No other flag may be placed higher than the flag of the United States or to the United States Flag's right. Question: During the Olympics, why were all the countries flags flown at the same height? Shouldn’t the gold medal winner’s flag be flown higher? Answer: When displaying the flags of two or more countries, they are to be flown from separate staffs of the same height. The flags should be of approximately equal size. International usage forbids flying the flag of one nation above that of another nation in time of peace. Question: How should the American Flag be used when hanging over our Main Street on Memorial Day? Answer: When the flag is displayed over the middle of the street, it should be suspended vertically with the union to the north in an east and west street or to the east in a north and south street. Question: Can the American Flag be used to unveil our town’s new statue? Answer: The flag can be used at the ceremony of unveiling a statue or monument, but it should never be used as the covering for the statue or monument. Question: Is there a special way of raising the American Flag for half-staff? Answer: When flying the flag at half-staff, it should first be raised to the peak for an instant and then lowered to the half-staff position. The flag should be again raised to the peak before it is lowered for the day. Question: How should the American Flag be used during a funeral? Answer: When the flag is used to cover a casket, it should be so placed that the union (stars) is at the head and over the left shoulder. The flag should not be lowered into the grave or allowed to touch the ground. 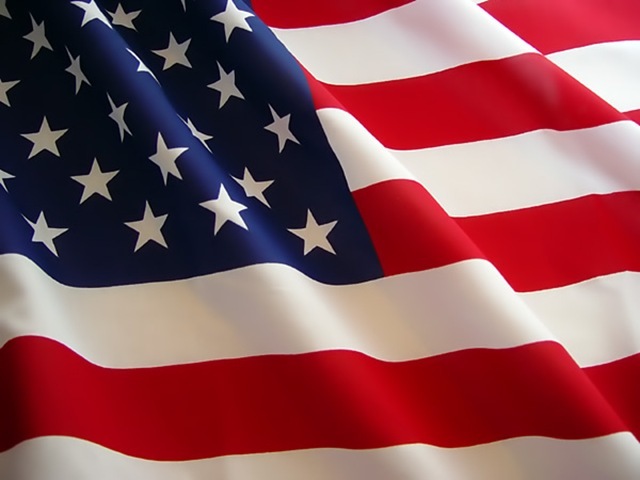 Question: What do the colours of red, white and blue stand for on the American Flag? Answer: The flag consists of thirteen horizontal stripes, seven red alternating with 6 white. The stripes represent the original 13 colonies, the stars represent the 50 states of the Union. Red stands for Hardiness and Valor, White stands for Purity and Innocence and Blue stands for Vigilance, Perseverance and Justice.